ObjexxSISAME input files are structured YAML-style text files that are human readable and editable. The nested "tree" structure is also used in the ObjexxSISAME GUI model editor. 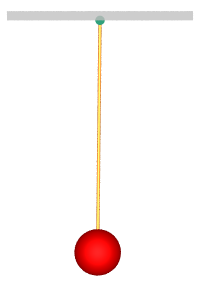 Here is the ObjexxSISAME input file for a simple pendulum model and the POV-Ray™ image it generates at t=0.